Multiple colors of Pikmin spirits. Since this subject has no official name, the name Spirit is conjectural. To do: "Soul" is what they're called in the game (by Olimar), so this article should have its named changed to that. For the spirits in Super Smash Bros. Ultimate, see Super Smash Bros. Ultimate#Spirits. Spirits appear every time a Pikmin or enemy is killed. These ghostly shapes ascend slowly until they fade away, reminding or alerting the player that a Pikmin or enemy has fallen. Suggestions: Specify the shape and color of each Pikmin type, but take into account each game (New Play Control! versions too). The Pikmin ones roughly resemble a Pikmin's shape; however, they lack feet and leaf, bud or flower, and any identifying characteristics such as the Red Pikmin's nose. Their appearance is slightly transparent and they vary between the games. In Pikmin, every Pikmin has a blue spirit, irrelevant of the color of the Pikmin itself, while spirits in all other Pikmin games, including both New Play Control! remakes, are representative of the dead Pikmin's type, differing in color and slightly in shape. If a Pikmin dies from being thrown into the abyss, it won't release any spirit in Pikmin or New Play Control! Pikmin, but it will in Pikmin 2 and New Play Control! Pikmin 2. In Pikmin 3, no spirit will be seen ascending from the abyss but it will actually be visible on the KopPad. The spirit of a recently killed Dwarf Bulborb. 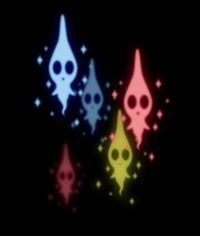 Enemy spirits have a pink-purple color and look like a bubble, and leave a transparent trail behind. Two holes resembling eyes are visible near the shape's center. Bulbmin produce a smaller version of this type of spirit when they die. However, enemies that do not really "die" do not leave a spirit when killed. This is the case for the Spotty Bulbear and the Gatling Groink, which can revive, and the Ravenous Whiskerpillar, which seems to remain alive even after being defeated. Enemies that die while petrified release a spirit, but these "non-dying" enemies do not. In Pikmin 2 these spirits make an eerie sound when ascending. The sound is much deeper, and the spirit is much larger for bosses. In Pikmin 3, enemy spirits are blue instead of purple, have small white eyes, and have a small "tail". An enemy's death in this game means that the carcass is ready to be carried – the enemy cannot be picked up until the spirit is actually seen. Due to the way off-camera objects are handled, an enemy's spirit will not ascend until it is once again visible on-screen. A screenshot of a Pikmin spirit in Pikmin. In Pikmin, all spirits of Pikmin are blueish white. A Winged Pikmin's spirit. Note the wings. 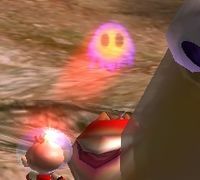 Two enemy spirits as they appear in Pikmin 3. The appearance of Pikmin spirits in Super Smash Bros. Brawl. The texture used in Pikmin and Pikmin 2 for the Pikmin spirits. The textures used in Pikmin for the enemy spirits. The texture used in Pikmin 2 for the enemy spirits. Spirits as seen on the GamePad. A montage showing each Pikmin's spirit. Pikmin spirits in Pikmin 2 from falling into any abyss. They are quite low, so they are normally hard to see. Spirits of the Pikmin left behind during sunset, in the end of day cutscene. In Super Smash Bros. Brawl, Purple Pikmin do not release a spirit when they die, but they do in Super Smash Bros. for Nintendo 3DS and Wii U. The Pikmin spirits resemble kodama, a Japanese myth about small ghosts that haunt trees. This page was last edited on April 14, 2019, at 19:46.